Halloween is coming up. Why not teach your students in a Halloween theme. Gynzy made a ready-made Halloween themed lesson for you. 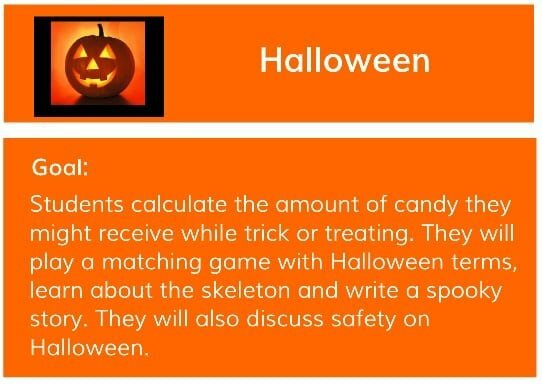 This lesson includes calculating the amount of candy your students might receive while trick or treating, a matching game with Halloween terms, learning about the skeleton and writing a spooky story. Lastly, this lesson provides a video that allows you to discuss safety on Halloween. Click here to use this Halloween lesson in your classroom! This lesson exists of the following seven elements. The lesson starts with singing the Monster Mash Song, to get all students involved in the Halloween theme. Divide your students into two teams. Let each team roll three virtual dice turn by turn. The first dice represents how much candy you get per house. The second dice represents how many houses there are on a block. The last dice represents how many blocks you walk to trick or treat. Let your students calculate how much candy they will receive according to the numbers on the dice. If the team’s answer is correct, they may add the treat of their choice to their team’s bag. Use memory with your own words to get students familiar with words related to Halloween. Each team gets their turn to flip two cards. When the cards match, the team is awarded points. Let your students write a spooky story. Use your interactive whiteboard to brainstorm some creepy words. Now your students can start writing their story with those words in mind. Afterwards, your students share their stories with their classmates. See how a story with the same words can have so many different contents. Halloween is a great moment to discuss and learn about the skeleton. Use the Human Body activity to teach the anatomy of the human body. Use a video to teach students how to be safe during their Halloween round. Every family celebrates holidays their own way. Start a discussion with your students on how they celebrate Halloween and let them share their stories. Click here to use this pre-made Halloween lesson directly in your classroom on your interactive whiteboard! Happy Halloween!